I have a micro SD card of 32GB inserted, and I've formatted it to internal storage already. It is also set as default storage. My internal storage is nearly full. I cannot download anything onto my SD card, or even move any apps onto it. Yes, I have tried to go Settings > Applications > (an app) to see if I could change where it's stored. No, there were no options to do this, anywhere. The option itself to move the app did not exist. Also tried to move apps directly from my internal storage, but could not do this either. 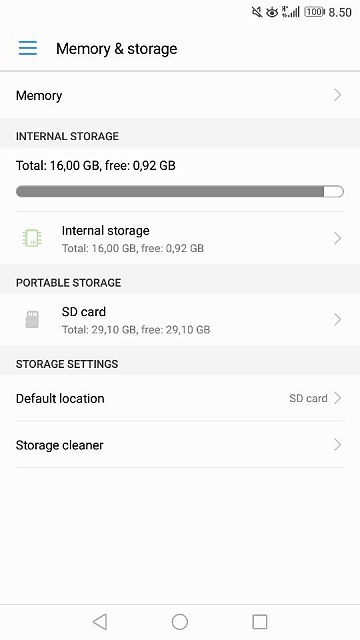 How can I download apps onto, move apps onto, or even use my SD card as storage? Please help, no article I've looked at for the last three hours has helped me. This is the same person as above asker. The fact that it says "Portable Storage" suggests that the card wasn't actually formatted as Internal Storage. If the card doesn't have any important data on it, try formatting it again, and make sure you select the option to format it as Internal Storage. I see what you mean. However, the SD card doesn't show as internal storage even after formatting it again. To do so, I switched the default storage to internal (format option for the SD card is greyed out otherwise) and rebooted. Then formatted the SD card to internal storage and rebooted again. The SD card was still recognized as portable storage so I switched the default storage back from internal to SD card. Nothing has changed. I suspect it's a problem with how Huawei has implemented Adoptable Storage. The only other thing I can suggest right now is to see if the same thing happens with another SD card, in case it's an issue with that card.